Anthony Whaling is a Network Consultant for BT and enjoys a good crime novel, stemming back from his early teenage days of Enid Blyton’s Famous Five his tastes have thankfully progressed over the years and these days he enjoys the likes of Lee Childs and Ian Rankin. Bob Skinner is a man not to be trifled with, as many have found out to their detriment. He does not suffer fools, and is as straight talking as they come. While attending a job interview (of sorts) in the House of Lords, Bob is seconded by the Secret Service to lead an investigation into a grizzly attack on the Prime Minister, Emily Repton, which has left her catatonic. With a top secret security announcement due to be made that afternoon by Emily, the situation could not be more sensitive. Bob, with his trusted friend and former colleague, Neil McIlhenney (brought in at his request); together they must piece together the events leading up to the attack and stave off a potentially embarrassing foreign diplomatic mess. This is my first Bob Skinner experience, and I found it to be an enthralling adventure striated with prescient British political intrigue. The story is steeped in modern British empirical fact, and is written with minute attention to detail. 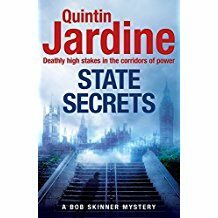 Jardine has a very good eye for detail and I could almost visualise each corridor and room in the iconic buildings that Skinner traverses in this most sensitive investigation. The characters (be they protagonist or antagonist) are excellently delineated, with each of them carrying a unique personality befitting of their roles and of their lives. The plot is well paced so nothing is revealed too early. This was a very evocative and intriguing tale, as it captured this reader right from the very first chapter to the dénouement. I’m definitely a new Skinner fan!